One arm, anyway. I’m the man in question. This collection of hardware came out of my right shoulder yesterday. 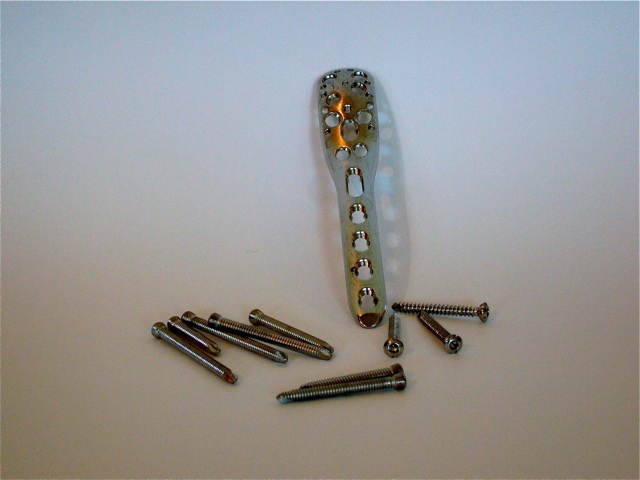 The plate is about 4 1/2″ long; the longest screw 1 3/4″ (the longer ones went into the ball of the joint). I broke my right arm in early December 2006 (orchard ladder, tree limb, chainsaw, whoops). The plate needn’t have come out, but it was inhibiting my range of motion, and after procrastinating for a few months, I finally went under the knife and got it over with. An outpatient procedure, by the way, albeit under general anesthesia. All told, the hardware weighs a couple of ounces. It does not trigger airport metal detectors; it’d make a nasty stiletto.